Bringing together Melbourne's most influential business leaders, this dinner celebrates the impact of philanthropy at the Faculty, and fortifies ties with the Australian business community. 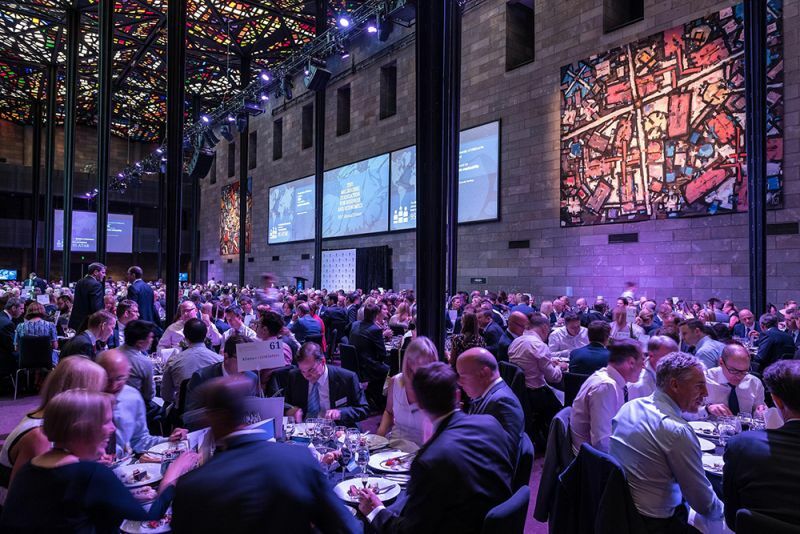 The 2019 Melbourne Foundation for Business and Economics Annual Dinner was held on the 7th March 2019 at the Great Hall, National Gallery of Victoria. Professor Duncan Maskell, Vice-Chancellor of the University of Melbourne was the Keynote Speaker at the 2019 Dinner. Professor Maskell has a distinguished academic career including as Head of the Department of Veterinary Medicine and the School of the Biological Sciences and most recently as Senior Pro-Vice-Chancellor (Planning and Resources), all at the University of Cambridge. In addition to these achievements, Professor Maskell has had an active entrepreneurial career. The evening also featured a panel discussion with Business and Economics academics on the dark side of modern work, moderated by Ms Ali Moore, Vice-Chancellor’s Fellow, journalist and broadcaster. View the photos from the evening. The Melbourne Foundation for Business and Economics aims to give bright minds a brilliant future by building a scholarship and bursary endowment for disadvantaged students. Its purpose is to support the Faculty's ambition of cementing Melbourne as a global hub for business and economics education, and strengthen our international standing and reputation for excellence. As a result of the Foundation's work, the most deserving students will get the best education regardless of their circumstances. We are grateful to donors and sponsors for their generosity and vision. The current Chairman of the Foundation is Anthony Burgess, Chief Executive Officer of Flagstaff Partners and Business and Economics Board Member. Business and Economics Board Members Sally Capp, Lord Mayor of Melbourne and Ben Walsh, Managing Director and CEO (Pacific) of Mercer are Co-Chairs of the Foundation Dinner Committee. Since 2011, the Foundation Dinner has celebrated the extensive connections between the Faculty and the business community, and has been a key event in recognising and reinforcing the impact of philanthropy on research outcomes and the student experience. Each year, over 650 guests attend, including many of Australia’s most influential business and public policy leaders, alumni, students and staff of the Faculty of Business and Economics. The night not only includes a superior dining experience and networking opportunities – but also a keynote address from a prominent business leader, a Faculty update from the Dean and an address from a current student. The 2018 Foundation Dinner was held on Thursday 8 March 2018 at the Great Hall, National Gallery of Victoria with special guest speaker Sir Michael Hintze AM, founder, Chief Executive and Senior Investment Officer of CQS. The night also recognises some exceptional contributions made by alumni to both the University and the wider community through the announcement of the year's Alumni of Distinction Award recipients. Businesses are able to sponsor tables at this event. For more information about attending or sponsoring the dinner please get in touch with us today. Keynote Address: Sir Michael Hintze AM, founder, Chief Executive and Senior Investment Officer of CQS. Pre-Dinner Panel Presentations on 1,000 Indigenous Business Leaders and Brain, Mind and Markets. Keynote Address: Ms Jayne Hrdlicka, CEO, Jetstar Group. Keynote Address: Mr John Fraser, Secretary to the Treasury. Keynote Address: Mr James Gorman, Chairman and CEO, Morgan Stanley. To find out more about the dinner, becoming a corporate sponsor, or the Melbourne Foundation for Business and Economics, please contact fbe-foundation@unimelb.edu.au. To learn more about making a donation to the Faculty of Business and Economics, please visit our giving pages.